Welcome to the Noordoostpolder. We welcome you to the largest tulip field area in the Netherlands. On average more than four meters below sealevel, the bottom of the former Zuiderzee has proven to be very suited for the cultivation of tulips. 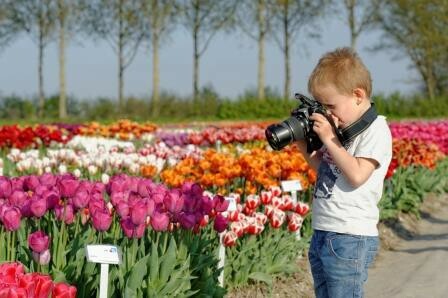 During the Tulip Festival, from April 15 until May 8 2016, you can enjoy the many multi-acre fields of tulips that bloom every spring in the Noordoostpolder. The tulip fields are vast and the tulips come in many different colors and varieties. During the Tulip Festival you can tour the tulip field area by car, bicycle or foot. With dozens of activities and events there is something to enjoy for everyone. Besides touring the area you can enjoy a carriage ride, visit the tulip show garden with more than 2,000 different varieties or pick your very own bouquet of tulips in the special tulip garden. Enjoy a drink or some food at one of the many restaurants you will find along the way. But there is more to the Noordoostpolder. Reclaimed from the Zuiderzee in the nineteen forties, the Noordoostpolder is characterized by its splendid views and squared fields, separated by straight ditches and tree lanes. Standing on top of the dyke you can see for miles, enjoying a magnificient view of the IJsselmeer and fields. The former island Schokland, listed by UNESCO as a World Heritage site in 1995 and the lovely old fisherman’s town Urk are also worth a visit.